With their flagship base series product, Topps gives a nod to unforgettable baseball moments in their 2017 Topps Series 2 release. Focusing on their "Memorable Moments" subset, one groundbreaking debut jumped out of the box of cards provided for this review. Winding up with a laser-eyed focus, Satchel Paige knew the cameras were on him as he stepped to the mound to deliver the goods for the Cleveland Indians on July 9, 1948. Topps captured the intensity of this moment in a colorized version of a classic photo of Paige rearing back to pitch for the Indians. While Topps fills in many missing pieces to their 2017 Series One product, the real catch of this set are the inserts, specifically the aforementioned subset. In honor of Paige's debut, below is a piece that I originally wrote in 2012 about Paige's debut that includes interviews with players who appeared in that game. 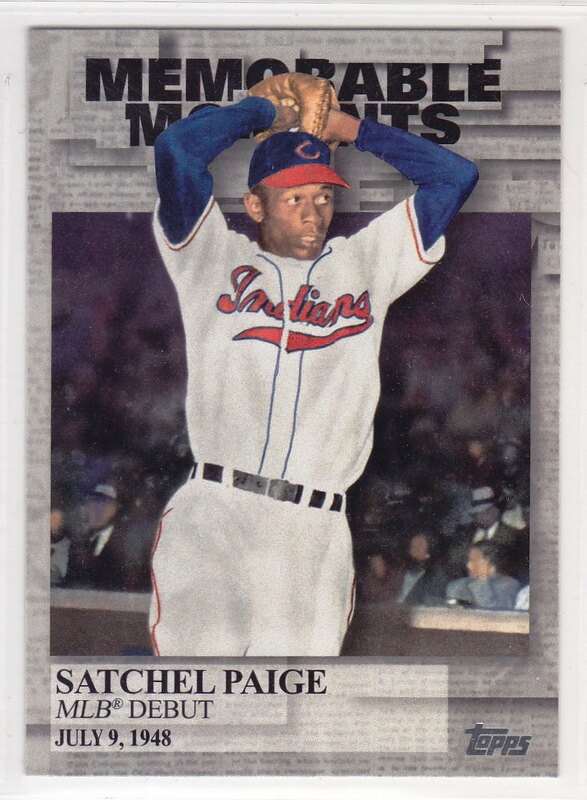 Just two days after the record books said he turned 42, Satchel Paige made his major league debut with the Cleveland Indians on July 9, 1948 in front of a crowd of 34,780 at Cleveland Stadium. The sheer magnitude of the situation shouldn’t have fazed the legendary hurler, who once pitched in the championship game of dictator Rafael Trujillo’s league in the Dominican Republic under the threat of a machine gun toting militia. Yet, for Paige, toeing the rubber on major league soil brought a sense of high drama, shaking one of baseball’s most experienced moundsmen. “I felt those nerves … they were jumping every which way,” Paige recalled. Standing at the plate for the St. Louis Browns was 29-year-old first baseman Chuck Stevens, who entered the game sporting a .252 batting average with one home run, certainly not the type of numbers that would rattle fear into opposing hurlers. While Paige admitted his nerves, Stevens on the other hand saw a familiar target. Back in the late 1930s and early 1940s, Paige came out to Stevens’ California hometown of Long Beach to play winter ball. The two squared off many times before that fateful day. Stevens wasted no time getting acquainted with his old friend. He promptly laced Paige’s offering into left field. Stevens dates his success against Paige back to a meeting they had a few years prior, just as he returned from his service in World War II. Stevens’ teammate Ned Garver was a 22-year-old rookie relief pitcher. Only in the major leagues for two months, he found himself right in the middle of this historical event. “There was never a time when there wasn’t a bunch of hoopla around Satchel because he was such a colorful guy,” said the 85-year-old Garver from his home in Ohio. Garver pitched two and one-thirds innings of scoreless relief for the save that day, but his clearest memories from that game started before a pitch was even thrown. Paige fooled Platt so badly for strike three with his famed hesitation pitch, that his bat once again took flight, this time flying up the third base line. Looking to extract some sort of revenge for Platt’s first toss of the bat, Garver said Satchel pulled one from his bag of tricks to finish the deal. Paige pitched two scoreless innings that day, quickly shaking whatever nerves he had when Stevens stepped to the plate. He finished the season with a 6-1 record and helped the Indians get to the World Series, where he made one appearance in relief. Even though his best days were behind him, he still had enough left to outsmart major league hitters and give fans a taste of what the major leagues missed in his prime.